I am writing a theme which uses different image sizes. So, as you can see, the sizes are 320px wide, 460px wide and 1366px wide. The problem is, when I upload a 1366px wide image it uploads the original file and additionally creates 320px, 460px and 1366px resized images. What I can see is that the autocreated someimage-1366x937.jpg is compressed, which I am not really anticipating. In my previous experience if the uploaded image had the same size as the largest specified size, it did not create a duplicate. I don't need these duplicated images with the same width as the original upload, they are just wasting storage space. I am using Wordpress 4.3. No plugins are added yet, so it's definitely something that is the Wordpress core is doing, I haven't experienced this before updating version 4.3 (I used a version 4.0 before and picked up developing WP again after 4.3 came out. Here is my image editing process. I always resize the image to the largest size needed. 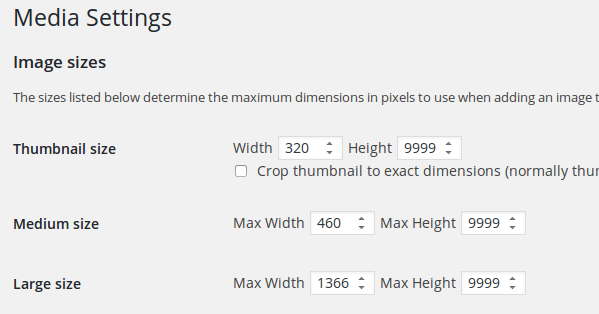 Some posts need 1366px wide images, some only need a 460px wide image. Whatever scenario applies, I want Wordpress to take the image I upload and not to recreate a compressed duplicate of it. Additionally, it has to create all the smaller sizes. It will delete the original image after upload and keep only the generated ones. Not the answer you're looking for? Browse other questions tagged images post-thumbnails image-resize or ask your own question. When Uploading JPEGs, Does WordPress Compress the Original Image? How to change image type for specific size?